From one of America’s finest food writers, the former restaurant critic for The New York Times, comes a definitive, timeless guide to Thanksgiving dinner—preparing it, surviving it, and pulling it off in style. From the planning of the meal to the washing of the last plate, Thanksgiving poses more—and more vexing—problems for the home cook than any other holiday. 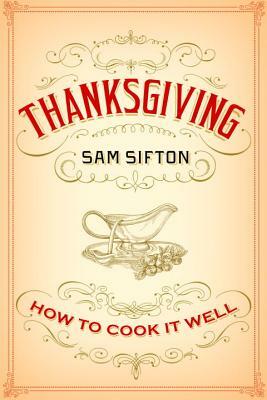 In this smartly written, beautifully illustrated, recipe-filled book, Sam Sifton, the Times’s resident Thanksgiving expert, delivers a message of great comfort and solace: There is no need for fear. You can cook a great meal on Thanksgiving. You can have a great time. With simple, fool-proof recipes for classic Thanksgiving staples, as well as new takes on old standbys, this book will show you that the fourth Thursday of November does not have to be a day of kitchen stress and family drama, of dry stuffing and sad, cratered pies. You can make a better turkey than anyone has ever served you in your life, and you can serve it with gravy that is not lumpy or bland but a salty balm, rich in flavor, that transforms all it touches. Here are recipes for exciting side dishes and robust pies and festive cocktails, instructions for setting the table and setting the mood, as well as cooking techniques and menu ideas that will serve you all year long, whenever you are throwing a big party. Written for novice and experienced cooks alike, Thanksgiving: How to Cook It Well is your guide to making Thanksgiving the best holiday of the year. It is not fantasy. If you prepare, it will happen. And this book will show you how. Sam Sifton is the national editor of The New York Times, the newspaper’s former restaurant critic and a food columnist for the Sunday Times Magazine. Before coming to the Times, where he has also worked as the culture editor and the editor of the Dining section, he worked as a newspaper reporter and editor, a teacher in the New York City public schools, a first mate on a century-old schooner, and a prep cook. Sifton lives in Brooklyn with his wife and two daughters.